The new Beetle Dune is a completely redesigned model that invites adventure. Its powerful character is emphasised by a large central air inlet – with a silver frame – and a black honeycomb screen. In side profile, the black wheel well and body add-on extensions are eye-catching in conjunction with the lighter body colours. 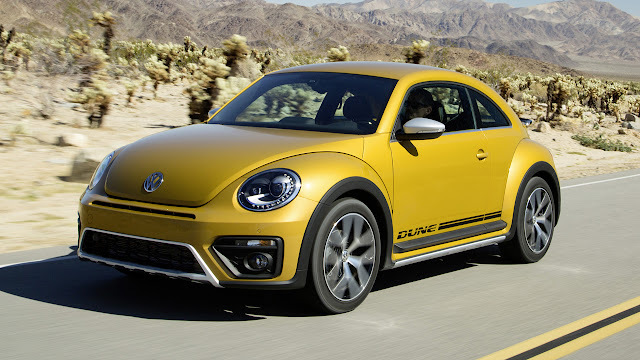 In addition, black side trim strips (stylised “Beetle running boards”) and the “DUNE” badge underscore the dynamic image of the latest Beetle model. Its ground clearance is increased 10 millimetres to accentuate its all-terrain properties. Three new elements define the rear of the Beetle Dune: along with a large rear spoiler (top in glossy black, surfaces beneath in body colour) and newly designed bumper (with diffuser in “Reflex Silver”), the new LED rear lights create a futuristic night design. 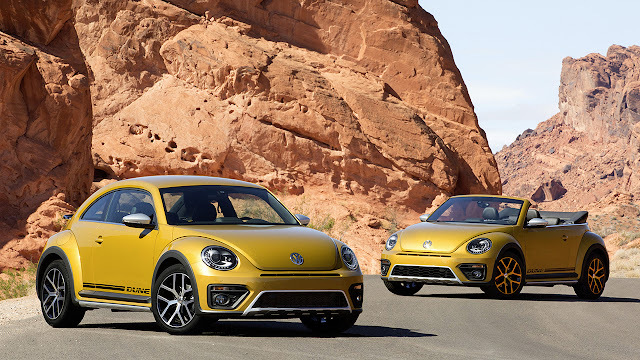 A total of nine body colours are available for the Beetle Dune. New to the colour range are “Sandstorm Yellow Metallic” and “Dark Bronze Metallic.” In addition, the Coupe may be ordered with the roof painted black. 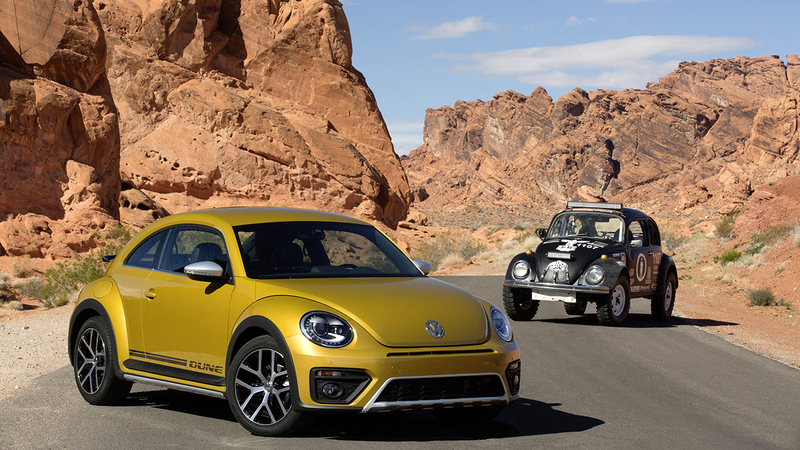 All of the Beetle Dune Cabriolet versions come with a black soft top. The trendy overall impression continues into the interior. Prominentelements include the Dash Pad (styling panel on the dashboard) painted in body colour and the extensive contrasting stitching on the sport seats, leather-trimmed steering wheel, parking brake grip, etc. In contrast, areas of the seat system, door trim panels, roof pillars and headlining are finished in black. The Beetle Dune features the latest generation of Volkswagen infotainment systems, which – depending onthe model – might be extended by adding a DAB+ digital radio receiver or a second Bluetooth phone interface. Voice control can be used to operate the radio, phone and access to connected media and – in the “Discover Media” system – the navigation functionality as well. In conjunction with the “Composition Media” and “Discover Media” systems, Volkswagen is also offering an optional high-end sound system by US manufacturer Fender. The key component of this sound system is a 10- channel amplifier with Class A/B output amplifiers and 400watts of output power (as well as woofers, tweeters, subwoofer, etc.). 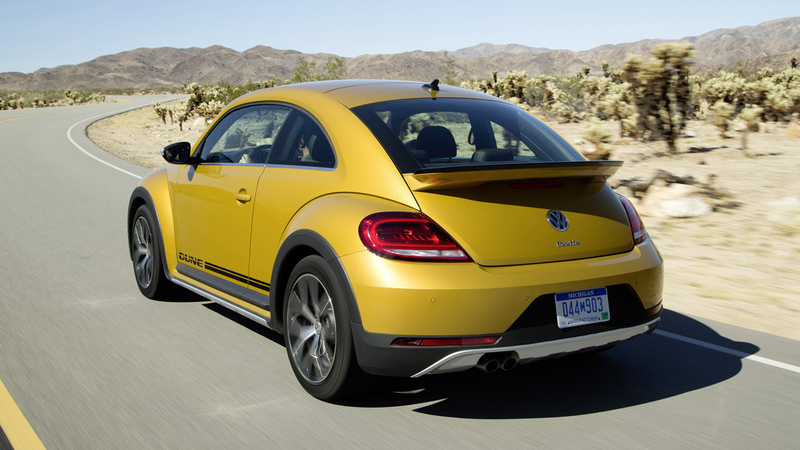 In Europe, the new Beetle Dune is available with three turbocharged petrol engines and two turbodiesels. The petrol engines produce 77 kW / 105 PS1, 110 kW /150 PS2 and 162 kW / 220 PS3; the diesel engines develop 81 kW / 110 PS4 and 110 kW / 150 PS5.